Snrky: It's acceptable to start mocking him, then? It's acceptable to start mocking him, then? Obviously we joke, applying development to social interaction. But there's a whole article out there about "Decoupling Reconsidered: Accounting for the Implementation Gap in Human Rights Treaty Regimes" by Wade M. Cole. That's not nearly as funny. In software development, the term “decoupling” is used to identify the separation of software blocks that shouldn't depend on each other. Some building blocks are generic and shouldn't know details of others. Special design techniques allow software designers to have as few dependencies as possible. This typically reduces the risk of malfunction in one part of a system when the other part changed. It also forces the developer to focus on one thing at a time. Title: It's acceptable to start mocking him, then? 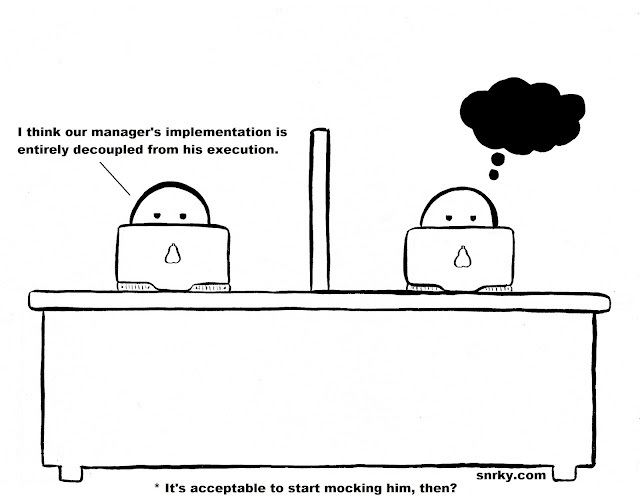 Snarky: I think our manager's implementation is entirely decoupled from his execution.